In the wild, the life cycle of wildflowers shows us what to do. When the flowers go to seed at the end of the season, the dry winds of fall scatter their seeds far and wide. The seeds become lodged in nooks and crannies in the soil where they winter over until spring conditions are perfect for germination. These seeds may form roots very early, long before we'd ever think of going out to sow them into cold ground. By the time tiny green shoots appear, they are already burrowing down deep into the soil to find moisture that will feed the growing plant all summer long. We make the mistake of sowing our wildflower seeds in the early days of spring as soon as the gardening urge strikes us. But, in many cases, this is too late, and the seeds will take weeks before roots are well-established. By that time, wild fall-sown relatives of the same species are already forming buds. It's easy to see why Nature's seed blooms earlier, and if we follow her example our wildflower gardens will be equally as early and prodigious as hers. There are other benefits to fall sowing as well. First off, you aren't as busy in the fall garden so there's more time to spend with the wildflower soil preparation. The weather is more stable at this time, too, and the soil not so muddy. Your new seedlings will be timed to take full advantage of the spring rains. The task of sowing fall wildflowers can be piggybacked onto fall bulb-planting efforts. In fact, wildflowers make a fine cover crop for spring bulb beds. The combination of certain wildflowers with carefully chosen bulbs can produce a unique look. To get started with wildflowers at your homesite, select a seed mix designated for your region. 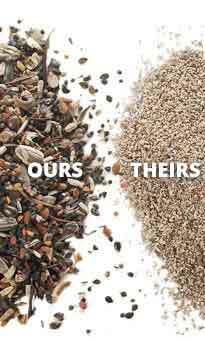 This is important because you want the most locally adapted seed you can get. American Meadows offers specially blended wildflower seed mixes online at AmericanMeadows.com. The site offers a wealth of knowledge, with step-by-step instructions for proper wildflower planting. The company sells seed mixes for the Northeast, Southeast, Midwest, Southwest, Far West and the Pacific Northwest. The Northeast mixture, for example, features 26 different wildflowers adapted to that region, which takes the guesswork out of selection. However, these are not all native wildflowers of the Northeastern states, but a collection of those from North America and Europe that grow well there. For a more regional approach, check out American Meadows' all-native mixes. These are for the purist who would like to grow only those plants indigenous to his or her local region. These wildflowers are more likely to persist and hopefully naturalize, because they are naturally pest- and disease-resistant. Keep in mind that not all the seeds germinate. Some are gobbled by birds, drowned in puddles or fall on hard ground. Therefore, it's important to sow at the recommended rate, or even more densely than indicated on the American Meadows Web site for that mix. For example, 1/4 pound of all-native seeds will cover 500 to 1000 square feet, so order accordingly. Wildflower gardening is a perfect way to make your yard a green haven for wildlife and outdoor living. That is, if you follow Mother Nature's example and, like her, sow your seed in the fall. American Meadows stars on HGTV's "Gardening by the Yard." Our wildflowers bloom in a magnificent Cover Story on AAA Magazines.